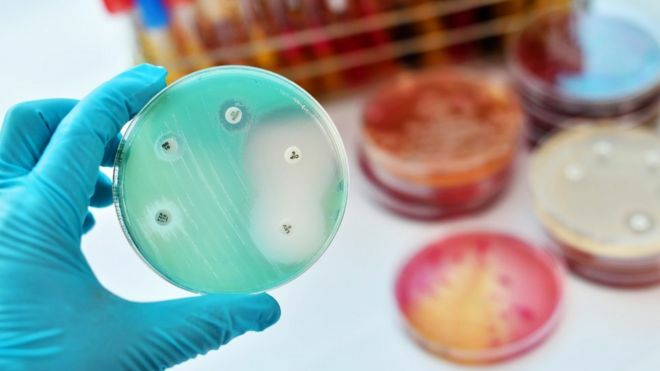 Drug-resistant superbugs are as big a threat as climate change, the health secretary will say as he unveils a new five-year plan to tackle the problem. Overuse of antibiotics is making infections harder to treat and lead to thousands of deaths a year through drug-resistant superbugs. The government plans to change the way it funds to drug companies to encourage them to develop new medicines. It is also increasing efforts to cut unnecessary use of the drugs. The government's plan aims to control and contain antimicrobial resistance - a term that covers drug resistance in bacteria, viruses, parasites, and other infections - by 2040, and reduce the use of antibiotics in humans by 15% over the next five years. It also plans to cut antibiotic use in animals by 25% from 2016 levels by next year. The drugs advisory body, the National Institute for Health and Clinical Excellence, and NHS England will also trial a new payment model that means pharmaceutical companies will be paid for drugs based on how valuable the medicines are to the NHS, rather than by the quantity of drugs sold. Health Secretary Matt Hancock, launching the government's 20-year vision at the World Economic Forum at Davos, Switzerland, will say: "Each and every one of us benefits from antibiotics but we all too easily take them for granted and I shudder at the thought of a world in which their power is diminished. "Antimicrobial resistance is as big a danger to humanity as climate change or warfare. That's why we need an urgent global response." For more than a decade, Catherine Williams has been battling an infection drug can keep at bay but not defeat. A urinary tract infection (UTI) as a teenager failed to properly respond to antibiotics and has since repeatedly returned, leaving her in serious pain and even requiring hospital treatment. Because the infection was caused by bacteria in her body that are resistant to the main form of antibiotics for UTIs, cephalosporins, and another type, gentamicin, it has never fully cleared. It has meant that the 32-year-old has needed to take antibiotics on and off ever since, just to keep the infection at bay. Some of her infections have been so bad they have required hospital treatment. Physically run-down and emotionally low, Catherine has had to take strong painkillers and steroids for the pain in her bladder. "It's horrific," she said. "The pain, you're bedbound until you're back on antibiotics and that's frightening, knowing that I have to stay on them to function normally. "Every time I come off them it comes straight back. "Why can't they cure something as simple as what I thought was an uncomplicated urine infection in my late teens, which has led to a lifelong hell for me?" Since 2014, the UK has cut the amount of antibiotics it uses by more than 7% but the number of drug-resistant bloodstream infections increased by 35% from 2013 to 2017. As part of the government's plans, there will be a drive to reduce infections contracted during operations and guidance for clinicians on how to prescribe antibiotics appropriately. Research has previously found that the medicines are often prescribed for conditions that are normally self-healing, such as sore throats, or for viruses, which do not even respond to antibiotics. be preventing at least 15,000 patients each year from contracting infections as a result of their healthcareHow are companies paid for antibiotics? How are companies paid for antibiotics? Drugs companies are paid for the amount of antibiotics they sell. The government says this has led to a "market failure" where companies are incentivized to sell existing antibiotics, rather than innovate and develop new treatments for infections where they are most needed. By changing to a model where companies are paid based on how valuable the medicines are to the NHS, the government hopes companies will start to invest in the development of new, high-priority drugs. Mike Thompson, chief executive of the Association of the British Pharmaceutical Industry, said pharmaceutical companies were "ready and waiting" to start testing the new model to support antibiotics research and development in 2019. He added: "The UK has shown international leadership in raising the profile of this global health threat and today reinforces its commitment to finding solutions to the issues which have hampered the development of new medicines for so long."